Who doesn’t love a good classic? My family loves The Princess Bride. Though I’m not sure I’m ok with a movie I grew up with being called a classic. To me those are the black and white films from another era. I know it’s denial! But I’m sticking with it. Because it’s just been my husband and I for the past month (our kids come back tonight!) we had two chicken thighs left over from the four pack that needed to be used. I wanted to go with Asian flavours for this dish. Prep the marinade for the chicken thighs first. In a bowl whisk peanut oil and soy sauce (we use gluten free amino acids) in a ratio of 3:1. Finely chop a clove of garlic, some scallion, and grate about a teaspoon of fresh ginger. Season with sea salt and pepper. Mix well and coat the two chicken thighs. Set aside for at least a half an hour. While you make the sauce, cook the rice noodles to the package instruction and grill the chicken. In a skillet heat up a couple of tablespoons of peanut oil. Chop 3-4 cloves of garlic and saute them on medium heat. You don’t want to brown the garlic. After a few minutes add about half a cup of chopped scallion. Add the leftover marinade from the chicken and 2 tablespoons of the soy sauce. Bring to a simmer and add a tablespoon or two of lime juice. Stir in a large spoonful of peanut butter. I chose chunky to save me a step of chopping up peanuts. Add more peanut butter as needed to get the right the balance between the sweetness of the peanut butter and saltiness of the soy sauce. When the chicken is nearly done add about a cup of chopped red bell pepper. Add the rice noodles with 1/2 a cup of the hot water the noodles were cooked in to thin out the sauce. Toss to coat. Top with the chicken and serve as soon as possible. Every once in awhile you have to go outside of your comfort zone. I had the opportunity to do that yesterday. I’ve mentioned Luca, a chef in town and a friend of mine, who does cooking shows. You might remember my daughter had a chance to do a show with him. He also does a weekly radio show on our local talk radio with Dan Mitchell talking about cooking and he brings bloggers, chefs, etc on as guests. He invited me to join him. I had an absolute blast doing this. I was nervous about doing it but I didn’t want to miss this opportunity to do something new. Here is the podcast if you would like a listen. But please, I know I sound American. Every time it comes up that I’m English, without fail, I get “but you don’t sound English”. That bothers me. Like there is a doubt of who I am. I came over very young and didn’t go back again until I was an adult. The accent doesn’t start coming out much until I’m back in the UK. It is what it is! Other than that I do hope you enjoy the podcast. And of course I had to show up with food. But because the show was in the morning and there isn’t a kitchen so it had to be something I could serve cold. I decided to do grilled chicken with tarragon. For dinner I did it as a salad and for the show I did it as lettuce wraps. For the marinade I finely chopped a few cloves of garlic and a handful of tarragon. Mix it with equal parts white wine and olive oil. Season with sea salt and pepper. Make sure it is mixed well and then add the chicken to marinade for at least an hour. Grill the chicken and let it cool. Meanwhile toast half a cup of pinenuts in a dry skillet. You want to pay attention as you are doing this. The nuts can easily burn. Keep the pinenuts moving in the skillet as you toast them. Once they are golden remove and set aside. I did try to do a wine vinaigrette but it just didn’t have any brightness to it. So I did up a tarragon lemon dressing instead. Do two parts olive oil to one part lemon juice. Add a bit of tarragon and season with sea salt and pepper. Shake it up. To assemble, lay out the lettuce leaves and layer with the chicken, veg of your choice, and the pine nuts. Drizzle the dressing over the salad and top with creme fraiche. It’s a lovely rainy day today. I say lovely because we’re still not having many of them. Optimistically we planted more seed to replace those that didn’t come up. Right now we have one leek and one onion coming up. Stand back and prepare to be overwhelmed! For the life of us we can’t grow beets. We keep trying. In fact we had one come up a few weeks ago but it disappeared. So did the carrots! So we replanted and also sprinkled blood meal round the beds. I hope we start to make some progress. The other night I was in the mood for Italian but nothing heavy as it was hot. I saw various ideas for bruschetta chicken which sounded wonderful. The drawbacks to the recipes was that they called for store bought dressings. It’s easy enough to make it from scratch. In a bowl mix 2 parts olive oil to 1 part balsamic vinegar. Add fresh thyme and finely chopped garlic. Season with sea salt and pepper. Add the chicken breasts to marinate for at least an hour. While the chicken is marinating prep the bruschetta part of the dish. Quarter the tomatoes and add a few cloves of finely chopped garlic in a bowl. Toss with olive oil, balsamic vinegar, sea salt, and pepper. The fresh mozzarella and basil should be added just before serving. 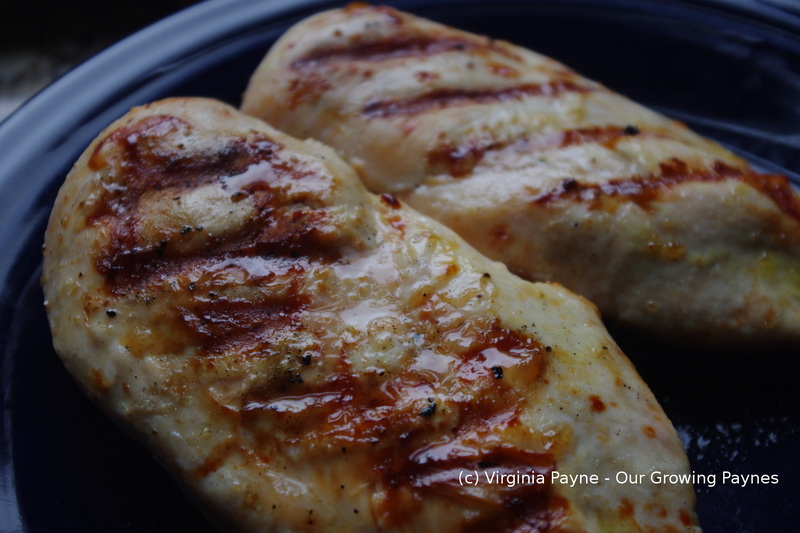 Grill the chicken and the slice it to serve over a bed of lettuce. As a side I also grilled up some veg to make a light supper. I love this time of year with all the fresh veg. Not so much the heat but you can’t have it all! Sunday we had a wonderful crazy day of celebrating 5 family birthdays with a family get together at the lake. The only thing wrong with the day was that my husband is travelling for a couple of weeks so he couldn’t be with us. The kids had fun swimming. I thought they were nuts given how cold the water was! But hey, they had a blast so who am I to argue. It took them a long time to actually get in though. We planned a potluck and I wanted a light dish without mayo as it was going to be warm. 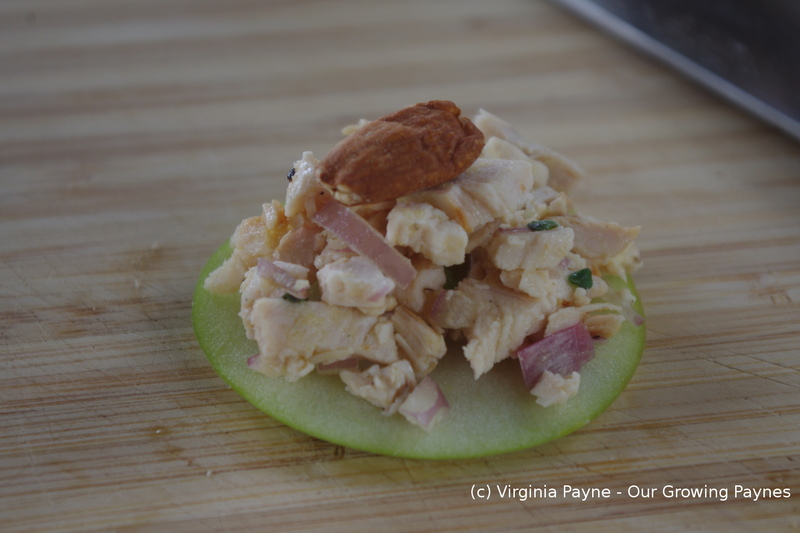 I came across an idea to use slices of apple instead of using crackers with chicken salad. The chicken salad they had was mayo based so I used my own but I loved the serving idea of fruit. I marinated chicken breast in olive oil, lemon juice, salt and pepper then grilled the chicken. Let the chicken completely cool. 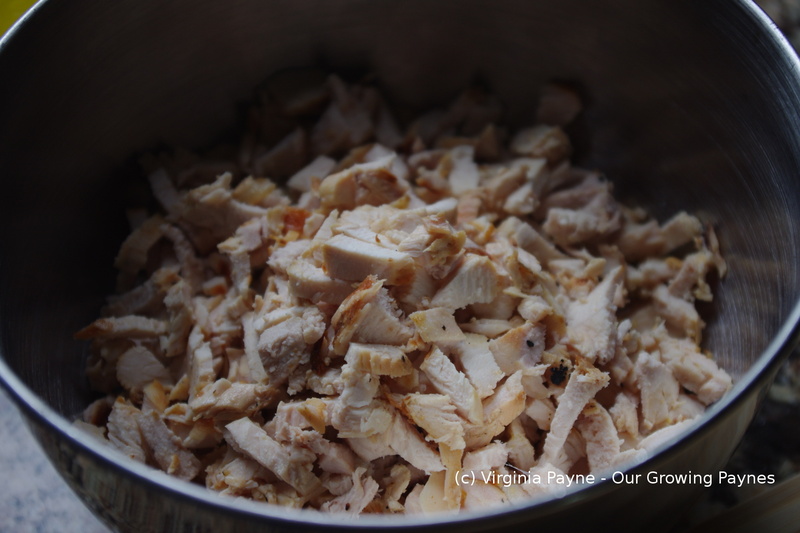 Chop up the chicken into small pieces and toss with olive oil and lemon juice. 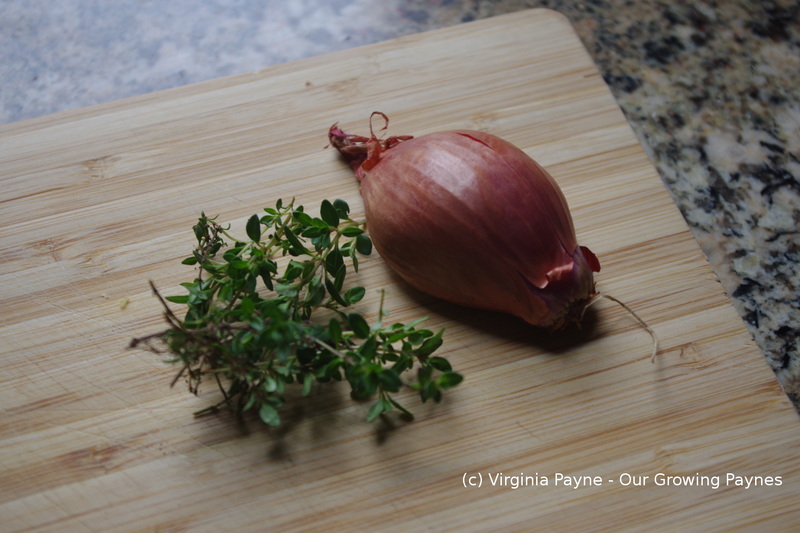 Finely chop a shallot and add a few teaspoons of fresh thyme. I got all excited when I saw the co-op was selling individual celery stalks. I only need two so it was perfect! Thinly slice the celery and mix in with the chicken and then season with salt and pepper. I made this the day before which allowed the flavours to meld together. Slice the apples and top with the salad and then add a nut of your choice.